Ferrying the public back and forth is a daily routine for the autowalas of the city. Running a transport lifeline for the city, they come across many difficulties; some of those include medical emergencies and accidents. 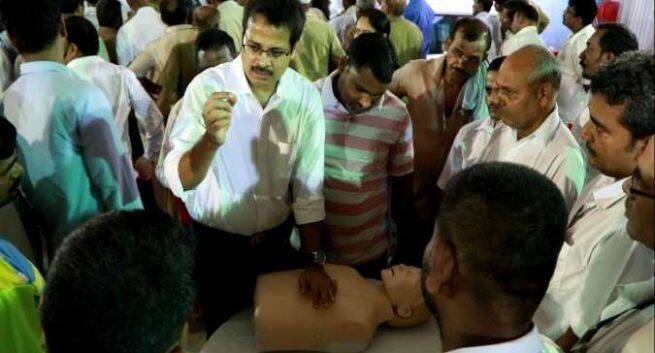 To equip the autowalas with basic lifesaving skills, Fortis Hospital, Mulund in Association with the Mumbai Rickshawmen’s Union organized a day-long session on Basic Life Support (BLS) and Cardiopulmonary Resuscitation training (CPR), which was followed by a health check-up for them at the hospital. The session witnessed over 250 autowalas actively participate in the activity which was led by Dr Vijay Shetty, HOD, Anesthesia, Fortis Hospital, Mulund. With an objective to train these men, who face medical emergencies – roughly 7/8 times every month, the hospital equipped them with knowledge on how to keep a person stable till medical aid arrives. The autowalas were trained in Basic Life Support which included First-Aid administration and Cardiopulmonary Resuscitation (CPR). Read: 11 first-aid tips you should know in case of road-accidents. Along with knowledge on how to attend to patients in such situations, a health check-up comprising of Random Blood Sugar, ECG evaluation, Blood Pressure and Body Mass Index (BMI) were conducted followed by consultations with doctor’s. Gracing the session were Shashank Sandbhor, Assistant Commissioner of Police, Bhandup Division, Mumbai, Actor, Harsh Chaya and Husain Dalwai, President, Mumbai Rickshawmen’s Union. Dr S. Narayani, Zonal Director, Fortis Hospital, Mulund, who headed the program said, “Equipping these men with basic skills in first-aid will help reduce the number of fatalities we see at Emergency Rooms. It will also help stabilize patients till medical aiid is provided, this significantly improves medical outcomes”. Read: A complete first-aid guide for you! Shashank Sandbhor, Assistant Commissioner of Police, Bhandup Division, Mumbai, said, “Massive number of autos ply across Mumbai every single day, equipping the rickshawalas with lifesaving skill is certainly a progressive step. They can help other motorists, pedestrians and even their family members, during time of medical emergency”. Migraines: Do men and women suffer differently?